New update with tons of improvements based on PAX and Steam Greenlight feedback, with accompanying dev blog update detailing all the changes and improvements. Here is the Steam Greenlight trailer. Bear in mind that the game has already been substantially improved since. This is still very much a work in progress. This is a major update, far more substantial than the previous updates thus far. Lots to cover. So this is the first demo update since Xenno The Rogue was put on Steam Greenlight and shown at PAX East 2017. I received an enormous amount of feedback from doing both (both positive and negative) and had the opportunity to observe many people playing my game at PAX (hundreds) to get an idea of what issues needed to be addressed and how to move forward with development. The most obvious change in this build is that all of the character animations have either been greatly improved, or redone entirely, with the interest in making the characters move more dynamic and smooth. Everything from how the characters walk (swinging arms and such), to how the main character climbs a rope, hangs from a ledge, and swims, has been improved or redone, including the actual movement code itself. All of the characters walk and run and swim in a rhythm now, corresponding with how their arms and legs are moving, as opposed to simply moving the character sideways at a steady pace, resulting in more lifelike motion. The next major change has to do with an observation I made of players at PAX. I noticed that on level 2, a number of players would climb up that first rope, and then awkwardly attempt to jump off and attack the archers on the platform above the blue gate, only to miss and plummet to the bottom, where they would have to climb the rope again and try to do the same thing with the same result. That wasn't how that situation in the game was designed to be handled at all, and I'm glad I got to see this behavior for myself so I could take appropriate steps to improve things. First thing I did was remove all jumping attacks. They were already pretty awkward to begin with, but then watching people try to use them just showed me they really shouldn't even be in the game at all. Rather than awkwardly jumping off the rope and trying to attack the enemy archers, it is far more effecient to jump off the rope and grab the ledge, hanging there for a few seconds until it is safe to pull yourself up, doing so and then attacking them. Besides removing the jumping attacks so these aren't attempted anymore, I also included a tutorial popup on the first stage to explain how the ledge grabbing/hanging mechanic is most effectively used in this kind of a situation. Xenno can grab and hang from the ledge indefinitely without falling or taking damage, and I could tell that players didn't realize that. The tutorial popup is my attempt at trying to explain this and how the mechanic was meant to be used to be the most effective. The next gameplay modification I made was making ledge grabbing in mid-air automatic. You no longer need to hold down JUMP to grab ledges. If a ledge is in range of being grabbed, Xenno will grab it now, and hang there indefinitely until you decide if he should pull himself up or drop down. Another notable control improvement I made is what I am calling "jump forgiveness." I had the pleasure of meeting and hanging out with Sebastien Benard of Motion Twin (Dead Cells) at PAX who spent a few minutes playing Xenno and remarking how it reminded him of the old side scrolling Prince of Persia games from back in the day. He noted that in Prince of Persia, gravity would not "kick in" immediately if you ran off the side of a ledge or tried to jump across a gap and miss-timed your jump button press. For a brief instant, you could still jump even though the character was technically in mid air. It made jumping far less annoying and less likely that someone will miss their jump and fall. This was a suggestion I loved, and implemented. Huge thanks to Sebastien for this improvement! If you are familiar with the Street Fighter games, you'll know what this is. Because Xenno's fighting mechanics are heavily based on attack combos, I have implemented some attack buffering to improve the controls. Now when you try to fire the bow while throwing an axe and the button is pressed too soon, the attack will now buffer and the bow will fire as soon as it's possible, rather than just not working at all. A small but significant change is that all of the enemy units (besides zombies and the rock monster) react to being hit now. Instead of just ignoring the axe that hit them in the face and attacking you, they get stunned for a few moments, allowing you to follow up with more strikes and kill them. 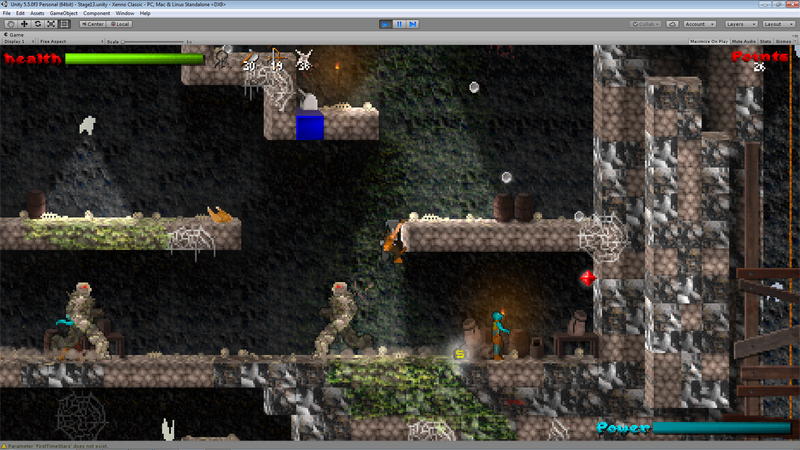 Lots of players persisted in trying to kill the rock monster, to both comical and frustrating results. I added a floating text popup above the rock monster each time he gets hit that says NO EFFECT. I also reduced the damage of his punch in half. Hopefully this is enough to make everyone realize it just needs to be jumped over and avoided and the consequences of messing with it aren't so lethal so quickly. Another funny observation I made at PAX was that players often got tired of swimming or climbing ropes, to the point that they would just walk away from the game and let Xenno drown. I think mostly the issue was the swimming. Sometimes Xenno got left hanging (literally), but most of the time when people walked away it was because the rock monster killed them with them trying to attack it, or because they got tired of swimming. So I boosted Xenno's swim speed and climbing speed a lot. Seriously, he swims and climbs ropes at superhuman speeds now. In fact I'm fairly certain he swims faster than he can sprint, but I have not done any tests to confirm this. I got a ton of compliments that the environments in the game are pretty and colorful, and some criticisms that certain areas need more work. 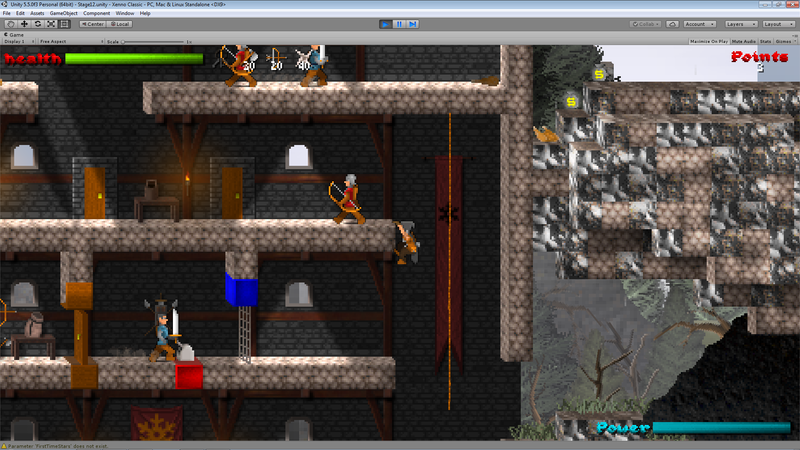 I added some more details, like barrels, boxes, buckets, cloth sacks, etc. I also added some more castle banners/tapestries. Always looking to add more. The video background on the main menu is no longer reflective of the currently quality of the game, but I have decided to leave it as is for now as a placeholder. I intend to replace it eventually. 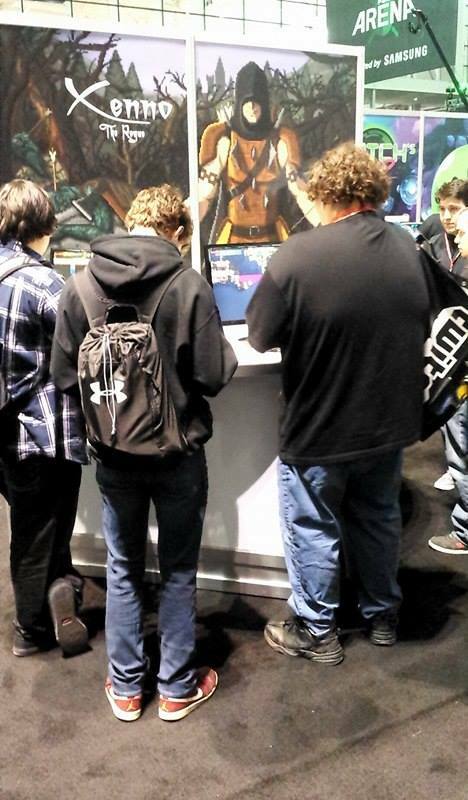 Showing Xenno The Rogue at PAX East was awesome for many reasons, partly because I got lots of feedback from people who played and enjoyed the game, but also partly because I got to observe the playing behavior of everyone who tried the game in general. This gave me enormous insight into how people perceive the game itself and how they approached the gameplay, and gave me an idea on how to further refine how the gameplay should be presented for maximum enjoyment with the least amount of learning curve. One example of this in particular which stood out to me on the expo floor is that a lot of players did not realize how to utilize the ledge grabbing/hanging/climbing mechanic in a way that made getting up to higher ground and attacking enemies effortless. That first rope in chapter 2 was a particular hot spot for this. Players would climb the rope to where the two archers are walking back and forth, and then awkwardly jump off the rope and try to attack them from the air, only to miss and fall to the bottom and have to climb the rope again, and repeat the same attempt with the same result. I did my best to show them that they *could* keep trying to do that, but to try jumping onto and hanging from the ledge where the archers are until it's safe to pull themselves up, and then light them up with the bow. The game made more sense to them when I showed them this, but it wasn't self-evident to them from the get go that they could just jump to the ledge and hang there indefinitely. I decided to just take out air attacks altogether (something I felt was pretty awkward anyway), and I plan to add a tutorial popup or two which visually shows them and explains the most effective way of handling that situation. There were a bunch of other similar observations, all of which I will attempt to address in the next update. Also coming in the next update is a lot of revamped character animations. One unique challenge when developing a game over the course of years is the fact that your creative techniques improve substantially since the time that you started working on the game, to the point that there is a disconnect between the work you did years ago and the work you just did on the game yesterday. Animation is one place in particular in Xenno that stands out as needing an update. A lot of the older animations are quite stiff and robotic and the next update will feature a whole new updated set of animations for a more dynamic look. As always, follow me on Twitter @JamieHolub, Facebook, IndieDB, Gamejolt, Itch.io, or just go to XennoTheRogue.com for the latest updates! Fun! I managed to get 6420 by spamming cannonballs but still didn't get to the snake. How far do you have to get to get it? in a dystopian medieval fantasy world overrun by the undead and religious fanaticism. 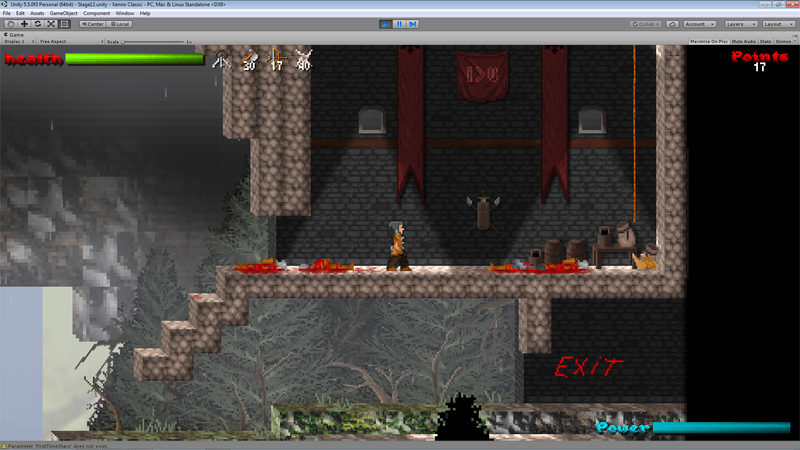 If you like gory pixel art platformers with zombies and knights and archers, check this out! All feedback welcome. Follow me on Twitter @JamieHolub for updates!